Viktor Schreckengost working on O’Neill in the studio. The early part of the 20th century was an age that produced both beautiful art and a group of pioneers in industrial design — designers and inventors who created functional solutions for the manufacturing industry. The trade paired creativity with logic. Viktor Schreckengost was one of the leaders in industrial design, creating everything from dinnerware to new cargo truck designs and everything in between. And while Schreckengost died in 2008 at the age of 101, his work is known throughout the United States — some of it through little-known designs that simply helped a product work more efficiently, while other examples include beautiful works of art. But Schreckengost was a creative artist first. 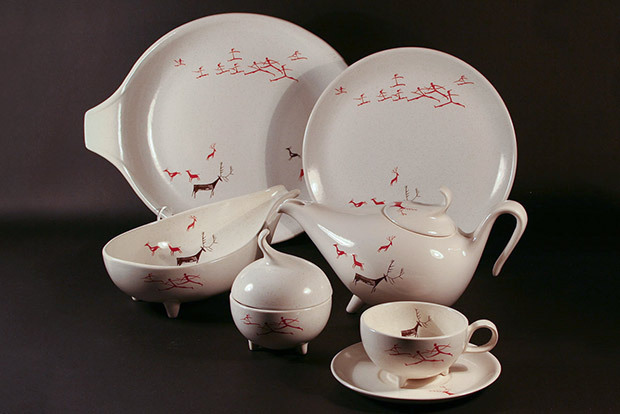 Trained as a ceramicist, he worked at Cowan Pottery Studio in Lakewood in the 1920s and 30s. “He was a studio artist, a watercolor artist, a draftsman, and a product designer,” says Bassett. Much of Schreckengost’s work can also be found at the Cleveland Museum of Art. Bassett says he has counted 23 works there that were designed or created by Schreckengost, who graduated from CIA, (then known as the Cleveland School of Art) in 1929 with a major in design and a minor in ceramics. He later founded CIA’s industrial design department in 1933 — the first department of its kind in the country. Schreckengost taught at CIA for more than 70 years, while also earning the honor of being dubbed the "American da Vinci" for his numerous works in a variety of media. 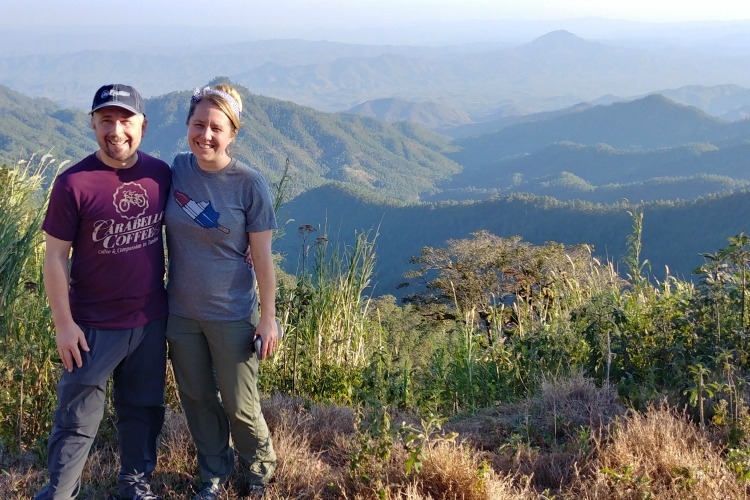 “He was very influential in many, many students’ lives,” says Bassett, who knew both Schreckengost and his wife, Gene. As an artist, Schreckengost is probably best known for the New Yorker “Jazz” Bowl that he designed for an anonymous client in 1930 while working at Cowan Pottery. Despite the fact it was the height of Prohibition — and he was reportedly good friends with Cleveland safety director Eliot Ness — Schreckengost’s inspiration for the design came from his visits with friends to the Cotton Club in Harlem to see Cab Calloway perform, according to Bassett. “It’s innovative and beautiful,” says Bassett of the bowl, adding that several dozen of the bright blue and black bowls were subsequently made when word got out that the anonymous client was First Lady Eleanor Roosevelt. Schreckengost’s locally known works include the “Early Settler” sculpture on the side of the Lakewood Civic Auditorium at Lakewood High School. Schreckengost originally titled the piece “Johnny Appleseed” when he designed and constructed it in the 50s, but it was later renamed by officials. Schreckengost researched the craftsmanship behind the tiles in New York’s Holland Tunnel before creating “Early Settler,” and then used the same company to fire the 600-pound, 17-and-a-half food high, 35-foot wide terra cotta sculpture. And perhaps best known are Schreckengost’s Mammoth and Mastodon sculptures, which today grace the Cleveland Museum of Natural History grounds. 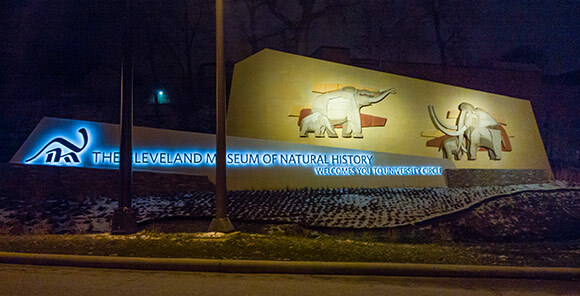 The 32-ton sculpture wall came to the museum in 2016 from the Cleveland Metroparks Zoo, after the zoo removed the 1955 work in 2008 to make way for the spacious African Elephant Crossing. Schreckengost used 87 sections of terra cotta – 50 pieces making up the mammoth and 37 making up the mastodon. Each stylized pachyderm weighs about 600 pounds. The process of reconstructing the two 12- and 13-and-a-half-foot tall sculptures along a wall made of Minnesota limestone was a painstaking effort done by the Cleveland Marble Mosaic Company. 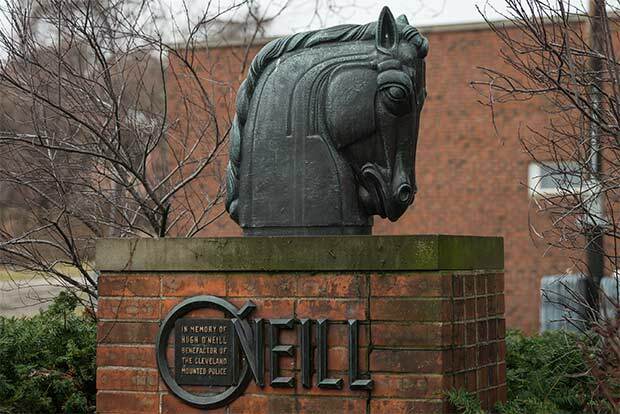 Another well-known Cleveland landmark, a horse head sculpture at the Cleveland Mounted Police stables — the O’Neill memorial — on E. 38th Street, was done by Schreckengost. Schreckengost’s “Time and Space” mural, also known as “Signs of the Zodiac,” adorned Cleveland Hopkins Airport when it opened in 1956. While the mural was removed in the 90s to make way for airport renovations, the Intermuseum Conservation Association (ICA-Art Conservation) took it into storage in its climate controlled Hingetown facility in 2013 and is restoring it for a future purpose. In 2006 Schreckengost was awarded the National Medal of Arts for both his work as a sculptor and as an industrial designer. But while Schreckengost’ s sculptures are well known and appreciated around Northeast Ohio, many of his industrial design achievements are simply taken for granted or no longer pertinent. Schreckengost was a professor at CIA when Daniel Cuffaro, today the chair of CIA’s industrial design department, was attending the school as an industrial design major. Schreckengost continued to make regular appearances on campus years later when Cuffaro returned as a professor. Part of his success in industrial design was Schreckengost’s programmatic approach to designing products. For instance, in the early 1930s, at the height of the Great Depression, American Limoges, based in Schreckengost’s hometown of Sebring, Ohio, hired Schreckengost to design dinnerware that was more affordable to manufacture and smaller in size. The popular dishware is considered to be some of the first mass-produced dishes of the era. The plates were decorated with colorful and animated images. “It was about bringing color into life, as opposed to stark,” says Cuffaro. In a time when laws mandated how long a truck could be, the White Motor Company used Schreckengost’s cab-over-engine truck design — the first design of its kind — that allowed for more length in the cargo portion of the truck. He also designed double-decker buses, riding lawn mowers, streetlights, and printing presses. 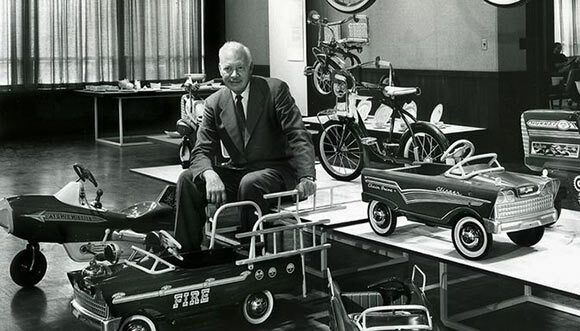 Most famously, Schreckengost created pedal cars with the help of the Murray Manufacturing Company. Murray was first known in 1919 for manufacturing auto parts, and Schreckengost would fabricate the pedal cars out of the blanks left from cutting car fenders. “There were piles and piles of wheel blanks and he used that waste material that had no use and turned it into something for kids,” says Cuffaro. Schreckengost’s creativity transformed the company. “Murray Manufacturing became Murray Bicycle,” Cuffaro says. “That move was so beneficial, we don’t know the brand as an auto parts [manufacturer], we know it for bicycles." Schreckengost went on to design Murray’s Pacemaker Series Mercury bicycle, which the company introduced at the 1939 World’s Fair in New York. Adding a bit of local trivia, Cuffaro says industrial innovation firm Nottingham Spirk has a photo of a young John Nottingham riding one the bicycles. 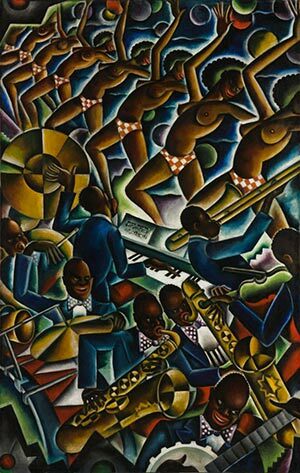 Although he’s been gone for nearly 10 years, Schreckengost’s influence is still evident in Cleveland both aesthetically and artistically. Related: on Friday, April 28, Mark Erdmann, ICA head of objects conservation, will discuss both “Early Settler” and “Mammoth and Mastodon” during the “Architectural Ceramics: Conservation and Installation Methods for Glazed Ceramic Relief Murals” lecture at the American Art Pottery Association 2017 convention, which is scheduled for April 26 through 29 at the Embassy Suites, 5800 Rockside Woods Blvd. N., in Independence. Related: The Cowan Pottery Museum in the Rocky River Public Library, 1600 Hampton Rd., features the work of American art pottery creator Guy Cowan and all of his associates, including Schreckengost. 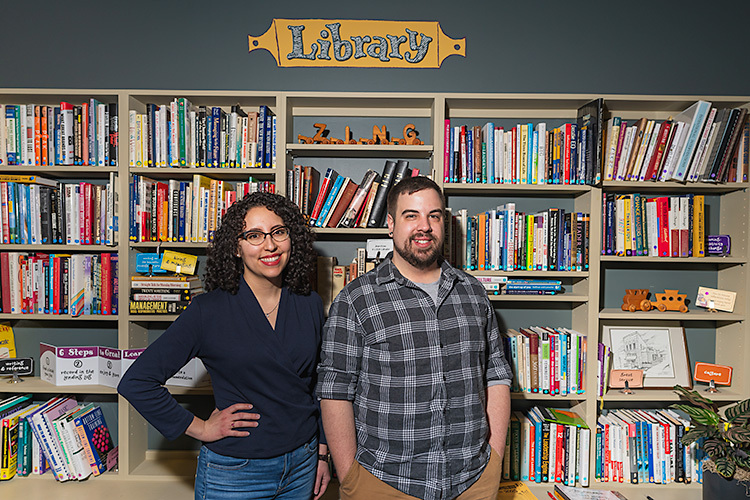 The 27th annual Cowan Pottery Symposium, which Schreckengost regularly attended, will be held this year on May 6, also at Rocky River Library. 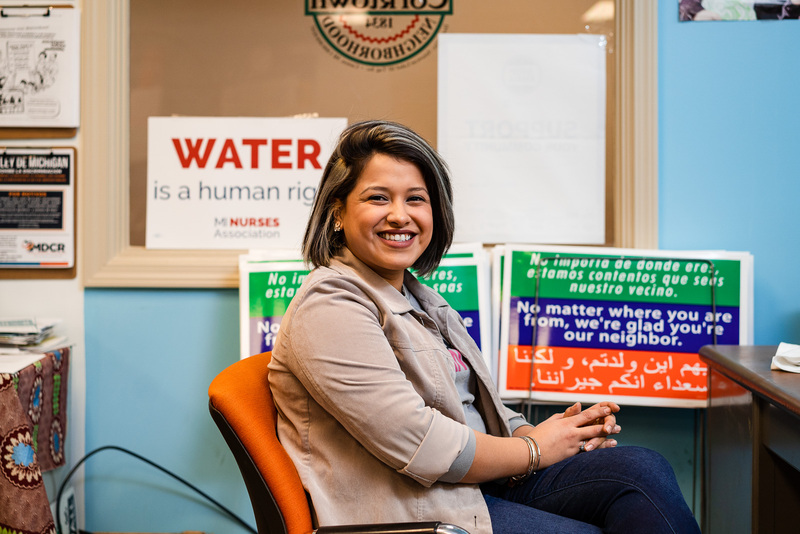 The Cleveland Institute of Art is part of Fresh Water's underwriting support network.